Loose or defective front wheel bearings. Replacing bearings, tie rod ends and king pins are standard operations whose descriptions can be found in other manuals. In this section we will deal with the steering gear box. When adjusting the steering gear box the front axle must be jacked up so that the front wheels are free of the ground. In a couple of steps you will be looking for a slight drag in the gear box which you cannot feel when the wheels are on the ground. For 1933, the steering gear box is a worm and sector gear unit designed to be semi-irreversible . This is to prevent road shocks from being transmitted to the steering wheel. In practice this means that the wheels will not return to the straight ahead position when the steering wheel is released. Your front end alignment shop may tell you the gear box has a problem: They are used to pushing and pulling on the tires to get their equipment setup. This will not work on the car. Don't worry about it, it is not broken. Adjust the worm gear end play. Adjust the sector gear end play. Adjust the worm and sector gear mesh. The worm gear end play is adjusted by turning the steering column tube. The screw threads at the bottom of the column adjust the end thrust of the worm gear bearing against the front of the gear box. Jack the front tires up off the ground. 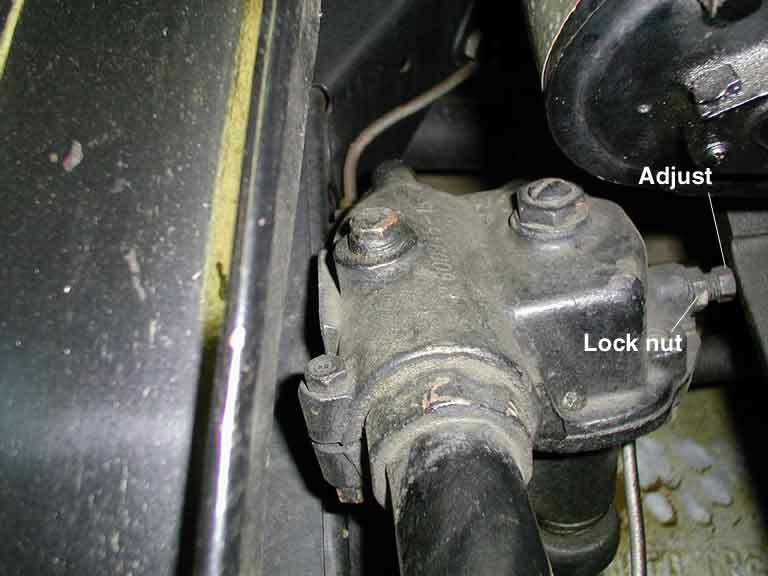 Loosen the U-bolt that clamps the steering column to the dash board. Loosen the clamp bolt on the gear box at the bottom of the steering column. This bolt is on the frame side of the gear box. Tighten the steering column using the large hexagonal flats at the end of the steering column. Tighten until there is just a slight drag on the steering wheel then back off 1/4 turn. Tighten the steering column clamp bolt on the gear box and the steering column U-bolt on the dash. The sector gear adjusting screw and lock nut are located on the top of the steering gear box. Loosen the sector gear adjusting screw lock nut. Tighten the sector gear adjusting screw until it just touches the sector gear. Maintaining the adjusting screw at its adjustment, tighten the adjusting screw lock nut. The steering gearbox is built in two castings. These castings move in respect with one another to adjust the worm and sector gear mesh. If not already jacked up, jack the front tires up off the ground. Loosen the four nuts that hold the sector gear housing to the worm gear housing. These bolts are accessible from below the car. Loosen the worm/sector mesh adjusting screw lock washer. The worm/sector mesh adjusting screw is located on the engine side of the steering gear box. Adjust the worm/sector mesh adjusting screw until there is just a slight drag on the steering wheel in the straight ahead position. The gear box is designed to have more play when at either end of its travel. If it is adjusted to have slight drag at some other point than straight ahead, it will be too tight in the straight ahead position. Tighten the four nuts that hold the sector gear housing to the worm gear housing. Tighten the worm/sector mesh adjusting screw lock nut. Lower the front tires to the ground.